The staff and management of eThekwini Cheese got the chance to showcase their factory to the people who made it possible when IDC CEO Mvuleni Geoffrey Qhena and his team paid a visit on Friday, 26 August. 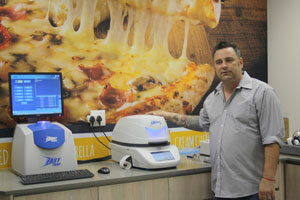 Based in Ballito, about 40 kilometres north of Durban, eThekwini Cheese is looking to set a new benchmark for the manufacture of cheese substitutes, functional cheese products and quality processed cheese in South Africa. It started trading in July 2016, and is one of 142 KwaZulu-Natal companies that the IDC has supported since 2009, leveraging its partnerships with commercial banks, business chambers and government departments in the province. 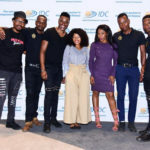 The factory visit formed part of the third IDC CEO Regional Roadshow, which saw Qhena and members of his staff engaging with existing and potential new clients at a well-attended event in Umhlanga. 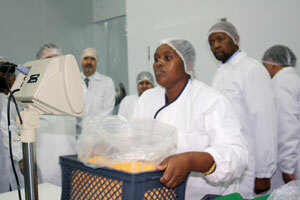 eThekwini Cheese’s value-added substitute products are manufactured for both industrial and food service uses. They all contain grade A cheese, and in most cases replace some of the butter fat found in natural cheese with vegetable oil. Company founder and MD Simon Dixon told Qhena and his team that the technology and expertise for producing these products “has been perfected to the point that there is no significant difference between the substitute product and its natural cheese equivalent. The company’s products have also been developed for characteristics, such as restricted melting points, which allow for their use in a wider range of applications than their natural cheese equivalents. Besides being accepted in the US and Europe, Dixon said, “they provide an opportunity for nutritionally beneficial products to become significantly more widely available to South Africans and sub-Saharan African countries,” thus presenting “a real commercial opportunity for profitable business growth”. After building two successful family businesses in the US and UK, and with a combined history of nearly 80 years in cheese processing, Simon and his brothers Stephen and Antony turned their attention to growth opportunities in South Africa. They teamed up with Ntombizodwa Cheryl Cagi to test the market, spending four years importing Dixon family products from the US. When they decided to start manufacturing locally, it was the IDC they turned to for funding. “The IDC was involved in securing approximately 50% of the finance needed to support the business in the way of a capex loan and a working capital loan,” Dixon said. The support services that accompanied this “ensured that the business plan, including capital budget and operating budget, were constructed in a professional and detailed manner”. eThekwini Cheese’s staff complement currently stands at 20, with ongoing phased recruitment of about three people a month ensuring that each new staff member receives proper attention during training. “We want to build a successful, profitable business that supports the local community not just in employment opportunities, but also takes an active role in corporate social responsibility,” Dixon said. “We anticipate employing approximately 90 people within a two-year period,” he said, with 95% of the staff coming from the community of Shaka’s Head, a township literally walking distance from the cheese factory. Dixon believes the cheese processing manufacturer “has the potential to set the benchmark regarding technical expertise and service delivery in South Africa”. 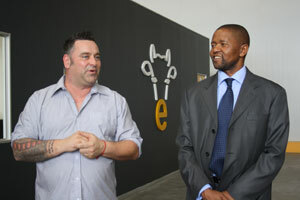 eThekwini Cheese was honoured to host the IDC chief executive and his team, he said, as it gave the company the chance “to showcase the factory to the people who made it possible”.